I've hardly skied at all this winter. My bones ache, and my balance is off. My life balance is off. My son's cancer fight is all encompassing. The treatment timeline continues to drag out. By the time of the day I am writing about it had been a month longer in this bone marrow transplant round then we had expected. I had made a few tentative plans for my ski work with that timeline in mind. However, as the treatment continued inpatient at the hospital those projects started to creep up the calendar on me. I had canceled most of my trips and projects by that point, and only had a few things going with Telemark Skier Magazine and a Vertical Integration trip in the midwest on the Upper Penninsula of Michigan. I figured I had better start making a little time to get on skis and knock the rust out a little. The planets aligned a little to get out and ski with the old crew from Snowbasin in Ogden, Utah. I jumped on it to get in shape some and also to take advantage of seeing my old buddy and mentor that was in town, "Tele" Jeff Lee, who now lives up in Alaska. ^I must say it was a grey day. The weather was ominous. The "death cloud" was in full effect on the north to south running ridge line that makes up Snowbasin. However, with a crew of my oldest local ski buddies all together for the first time in quite a while our attitudes were right up there somewhere around bluebird day status. The snow was what we like to call "buff" or bordering on "butter" if the wind played in on it a little. 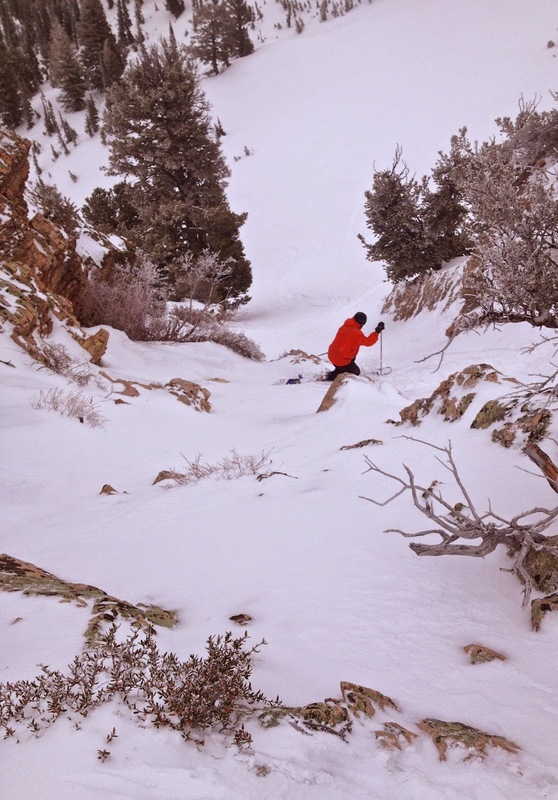 The main point being, it skied softly smooth and buttery at about three inches deep over the clean surfaces of the lonely chutes of Snowbasin. No bumps here. ^Also, with a crew like my long time local exploring partners, Ben Geiger and Wes Knopfel, and our old mentor visiting from Alaska, it felt sunny. 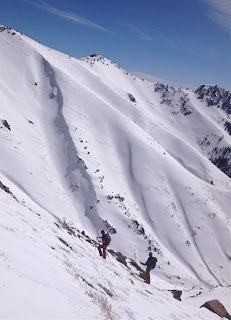 In the photo above, Jeff kicked a leg up with Ben as we prepared to enter an old favorite chute. On grey ominous days most folks stay where they know, and thankfully for us we know a lot of really great places that most folks wouldn't want to push on days like that one. ^It certainly pays to be local. No surprise. Jeff scores some smooth lovin' in the tight chute with trees that also serves to add a lot more visibility to the line. A little trick tip for ya! ^"Ole Uncle Wes", as I lovingly like to call him when we are goofing it up as Wes famously drops into a big line with a lit cigarette gingerly hanging from his lips. It is kind of funny how our skiing evolution manifests itself as we age and get saltier in these mountains. Back when we used to charge hard and buck cliffs there was no way Wes could have maintained a firm hold on a cigarette in his hat let alone his lips. However, these days his style has taken on the wisdom of uncertainties in the mountains and the ease and grace of an old veteran's movements to the point that when I roll up to him on the traverse not only is the cigarette still in place, but it remains just as loosely held with a long ash dangling from the end. 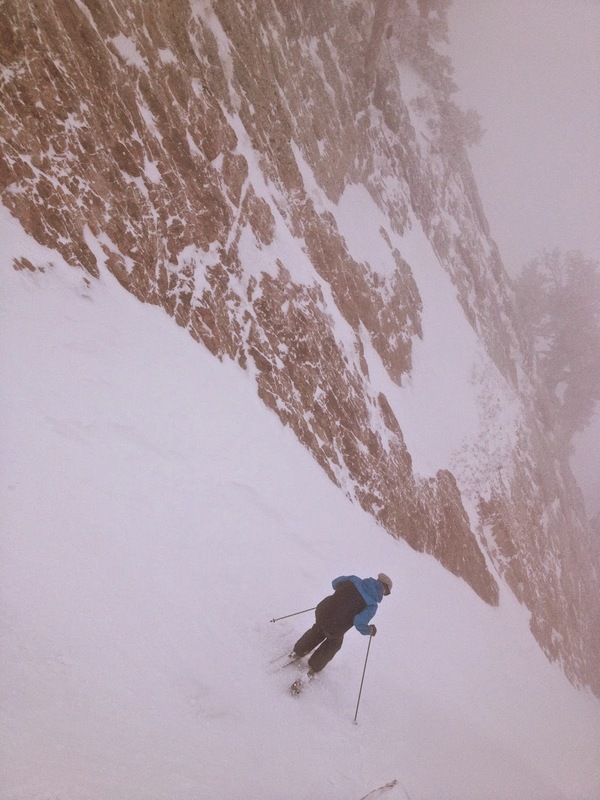 It was like the cigarette had no idea it'd ever skied an 800 vertical foot chute in three inches of dreamy cream snow. Hilarious! We ended the day in a windy howler on the west face traversing and boot packing to get to a favorite cirque of ours two peaks north of the gondola. My camera battery quickly died from the cold constant high winds. Gear dialed down to stay warm and keep skin from exposure to the wind I was all smiles under the ninja mask balaclava over my face. It felt good to be out in the clouds, wind, and exposure with my old crew. The day could've been ten years ago, or maybe we did time warp for just a moment in there. All I do know is that it felt really good to be out in that biting windy cold. Most people would run for cover, but we were all covered smiles and hand signals on the ridge like we'd been doing it together for years. Cuz we had, and we were again. As the cloud cover would fleetingly part for short moments on the ridge I wished my battery wasn't so cold so I could take a picture of the windows of view of the sun setting over the Great Salt Lake and Antelope Island. However, as I looked ahead and saw Ben, Wes, and Jeff shoving off down ridge to start getting into our lines I simply laughed to myself and uttered, "Haha, yeah, I'd love to take this picture, but I guess this one is just for me… this moment is mine." In what should have been incommunicable winds we flashed a few hand signals to each other from our positions lining the ridge and with precision we dropped nice lines one at a time across the cirque like a well orchestrated fireworks show shooting lines of fire across the sky. It was the kind of thing you can only have with a well-oiled and battle-tested crew. It was only one day, but now-a-days I know more then ever that one day lasts a life-time.